Tonight I made two more recipes from the "Voluptuous Vegan" Cookbook... Mondays are a day that I don't teach, so I have a little more time on Monday evenings to make something a bit complicated... Although, in the end this wasn't the most complicated or time-consuming dish to make. 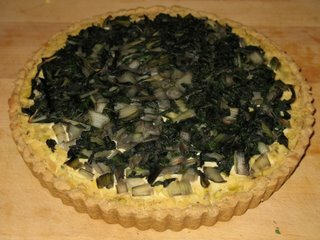 For the main dish I made the "Tofu Leek Tart with Pine Nut Crust" - yum yum yum!!! The tofu filling in this quiche was very, very good... even before it got baked. 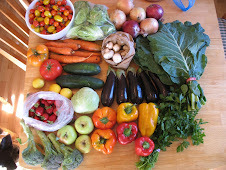 It would make a great spread for veggies or crackers or sandwiches. It was savory and flavorful, but still light. The recipe called for a topping of sauteed mushrooms, but I don't care for mushrooms, so I made a topping of braised chard instead. The pine nut crust was easy! I reduced the oil in a lot of places and actually I think I could have reduced in the crust as well... either way, it was very tasty! Sorry the picture is so dark... I am always cooking after dark, and we don't have very strong lighting. Here's a very crummy picture (no pun intended) of my second helping! 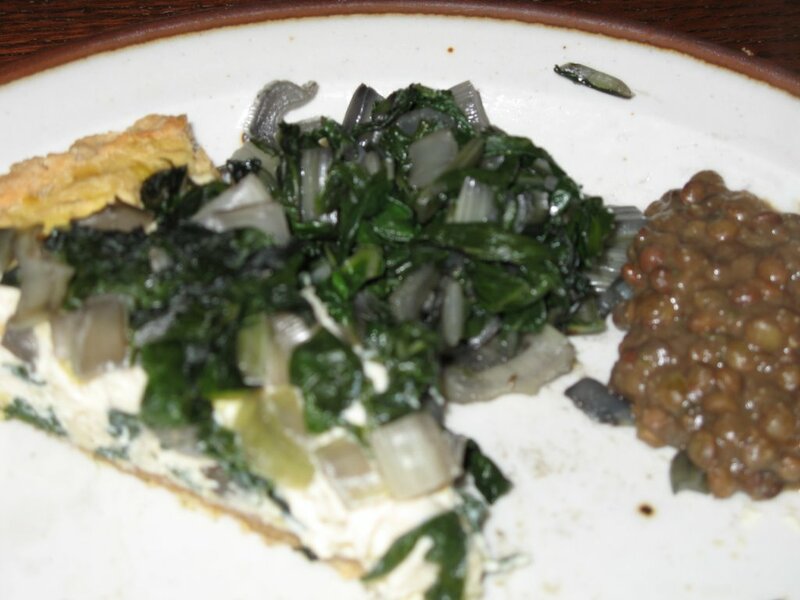 I served the tart with heaps of the extra braised chard, and also with the "French Lentil Sauce" that the cookbook recommended to go with this tart. The lentil sauce was really thick and quick savory and spicy... and I'm not sure why it would be necessary. I ate it (since I made it)... but there is a LOT left over. I'll try to incorporate it into another dish this week...??? I love the 'Voluptuous Vegan' especially because the recipes look complicated, but usually turn out to be pretty easy. I think I'll definitely be making a savory pie of some sort for Thanksgiving. That tofu filling looks yummy! And a pine nut crust- could it get more luxurious? I love leeks, and I love mushrooms too, so maybe I'll use a little of each. I have eyed that tart recipe, too. It looks amazing. It's nice to see what some more of the recipes from that cookbook look like! And the chard sub is a great idea -- I don't love mushrooms that much either and I like to be careful about making sure I get lots and lots of greens for the calcium. It looks like you also incorporate greens in lots of meals. Maybe you could have that lentil sauce on top of some pasta on one of your busy nights! Like, OMG! I love your blog!I'm so adding you to my fav links! Those apple hemp muffins look great btw! Yeah... it's true! I was so intimidated by "Volupt Vegan" - but really the recipes aren't very complicated to make. I'm so glad I cracked it open again. I think this tart would be even better with a little less tofu and a bit more veggie topping (or just mix the topping and tofu together... to add some more texture to the filling). Also, "The Modern Vegetarian Kitchen" and the "Real Food Daily Cookbook" each have a good tofu quiche recipe (especially the MVK book... ). Yes, I am crazy about greens! Unfortunately, Musty won't touch kale... but he likes spinach, chard, and collards. So those are the ones we eat! Holy smokes, that looks magnifique!